At Richardson Eye Associates, we meet many people who are surprised to learn that their "screen time" (time spent using a computer, laptop, smartphone, or tablet) can negatively impact their eye health. Our Richardson optometry team in Richardson, TX is happy to educate our patients about this modern day eye syndrome (affecting up to an estimated 90% of people who use computers at work) and empower them with the tips they need to avoid it. Computer vision syndrome is generally considered "eye strain" caused by excessive screen time use. But what is it about computers that can lead to eye discomfort? For one thing, we tend to blink less while using a computer, and blinking is necessary to replenish the protective layer of tears naturally found on the outer side of our eyes. 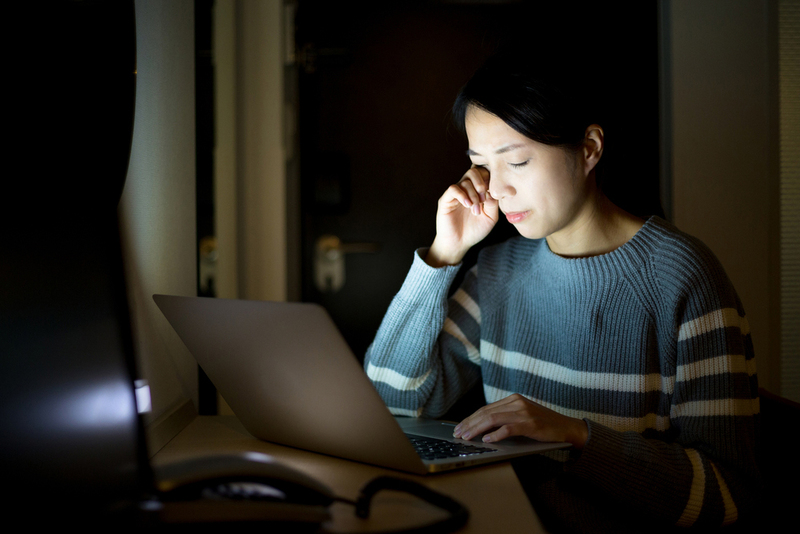 The contrast and bright lights from a computer, especially if overhead glare is present, can also lead to eye strain—and research shows that excessive exposure to blue light, in particular, may damage retinal tissue. Plus, we have to frequently focus and re-focus our eyes while reading on a computer, which can be tiresome after prolonged periods of time. So, what does computer vision syndrome feel like? You may feel like your eyes are dry and tired. Your vision may be blurry at various distances, and you may also experience headaches, neck and shoulder pain, or photosensitivity. While these symptoms are generally temporary, they can severely disrupt your ability to work, study, or even enjoy leisure activities on your devices. Importantly, both children and adults are at risk for developing computer vision syndrome. Give your eyes a break by thinking 20/20/20. Every 20 minutes of computer time, look away from your screen at an object at least 20 feet away and for at least 20 seconds. Remove overhead glare as much as possible, and avoid reading white text on black backgrounds. Consider getting an anti-glare protective coating on your prescription eyeglasses. Ensure your computer screen is kept at least one arm's distance away from you. Sometimes, uncorrected vision problems, such as astigmatism, nearsightedness, or farsightedness, may exacerbate computer vision symptoms. We remind you to schedule routine eye exams for yourself and your loved ones with our Richardson optometrist staff to ensure all your vision and eye health needs are being met. Are You Looking for Help Protecting Your Eyes? Contact Richardson Eye Associates in Richardson, TX for Quality Eye Care Near You! Contact our optometry clinic, Richardson Eye Associates in Richardson TX today at 972-231-3439 to connect with an experienced optometrist and get your entire family's vision and eye care needs up-to-date.